Some presentation slides that appear to show an AMD processor / chipset roadmap appear to have leaked from a private Gigabyte hosted event. 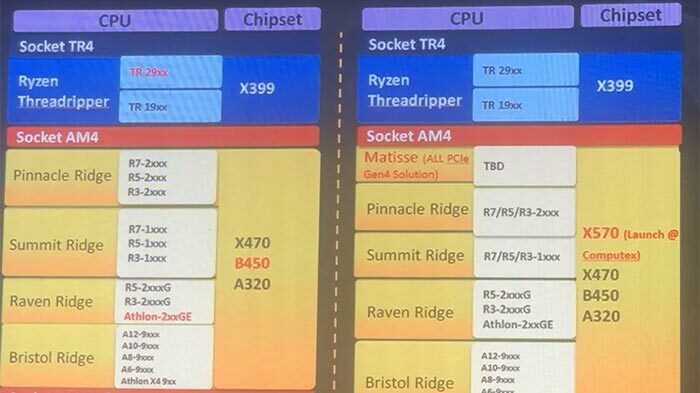 The key information presented in the slides is that AMD is readying its Matisse AM4 CPUs and the X570 companion chipset for launch at Computex 2019 (28th May - 1st June 2019 in Taipei). The slides were spotted on Gamer.com.tw by VideoCardz and though the headlining information seems new, these slides must have been presented ahead of the B450 chipset and Athlon 200GE series launches as these are still shown in red. If you look closely at the slide you can see next to the mention of Matisse that this CPU and its X570 chipset will support "all PCIe Gen4 Solutions". VideoCardz extrapolates the point that if this platform supports PCIe 4.0 "it would be very strange if Navi and Ryzen 3000 were not capable of supporting PCIe 4.0 as well". Previous leaked slides have pointed to Matisse and Picasso debuting as the replacements of Pinnacle Ridge and Raven Ridge, respectively, in 2019. Matisse CPUs will use socket AM4 and should arrive as the first consumer processors to feature Zen 2 cores and kick off the Ryzen 3000 series. At this early stage there are questions of how much compatibility there will be between the new processors and older motherboards, and vice versa, but yes - AMD is sticking with AM4 for now. 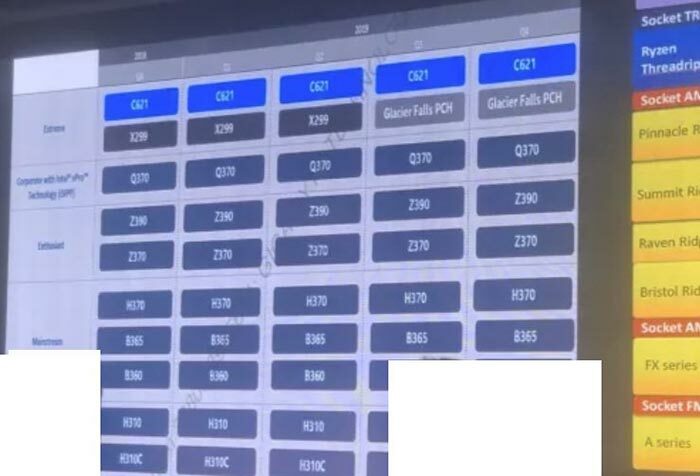 Another Gigabyte watermarked slide shared in the linked VideoCardz report shows that Intel is readying Glacier Falls HEDT processors for 3Q 2019. This will be replacing the current Basin Falls Refresh after only 9 months if it folows this plan. Elsewhere on this slide you will see the new mainstream B365 Express and the H310C Express chipsets. It isn't indicated or known how these will differ from the current B360 and H310. However, it is reasonable to guess that they will have beefier CPU VRMs to support 9th Gen Intel Core 6-core and 8-core processor SKUs with their potentially higher power requirements. Should I buy now the Ryzen 2600 or 2700, or wait the 3rd gen that will bring prices drop? Should I buy something available now or something available next summer?